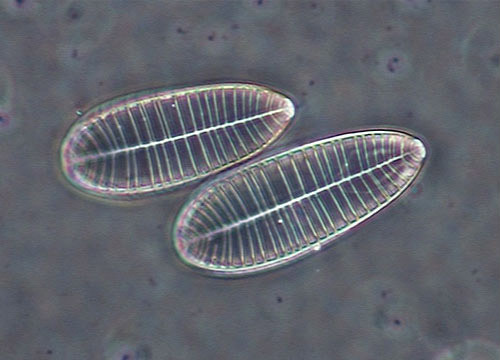 Diatoms are one of the most abundant plants on the Earth. Usually classified in the family Bacillariophyceae, these unicellular algae live in both fresh and salt water. Their extensive fossil record has made them a favorite tool of ecological researchers. Each diatom has a cell wall composed primarily of silica, which forms a pillbox-like shell, known as a frustule, around the organism. The cell wall is unusually beautiful and contains intricate markings and designs. 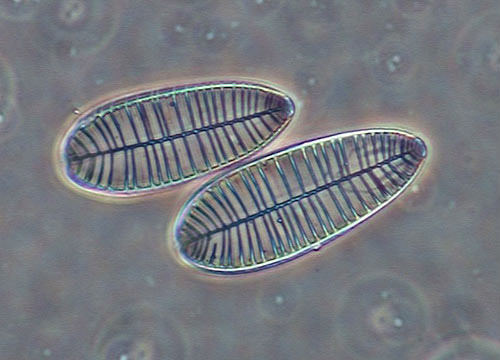 The color of the living tissue of diatoms is yellow-brown instead of the green frequently seen in other creatures that use light as a source for energy. There are an estimated 6 million diatoms per cubic foot of seawater, most of which are free-floating. Some, however, are bottom dwellers or grow on other algae and plants. Although not well understood, diatoms have the power of locomotion. Through a slit along the side of the cell, tiny microfibrils protrude and can be used to help the microscopic creatures move. Diatoms are important as food for other organisms living in water, but also serve other purposes for humans. For instance, diatomaceous earth, a substance composed of fossilized diatoms, is used in filters, insulation, abrasives, paints, and varnishes. Diatoms are also employed for scientific purposes. Although they are found in all of the world's aquatic environments, most species are habitat specific, living only in areas with certain physical, chemical, and biological characteristics. Therefore, by collecting and analyzing individual species and communities, ecologists can employ diatoms to help determine the condition of an aquatic habitat. Long-term monitoring of habitats and analysis of the fossil record provide scientists with a unique long-term perspective on marine ecosystems.